Popcorn can prove to be a healthy snack, provided it does not include saturated fats. It is a low-calorie food rich in polyphenol antioxidants. Lately, a group of scientists have found that popcorn has more antioxidants than most other fruits and vegetables that have a high water content. Thus, when prepared in a healthy way, popcorn can reduce the risk of heat disease. In addition, antioxidants boost the immune system and fight free radicals that are associated with several types of cancer. Moreover, it is a great food for those who are trying to control their weight. Basically, being a 100% unprocessed whole-grain, popcorn is rich in fiber and it makes you feel fuller for longer. In addition, fiber aids in digestion and healthy bowel movement. As this food is prepared from grains (corn), it is high in phenolic acid antioxidants that are easier for the body to absorb. Plus, it balances the blood sugar levels and helps lower LDL or the ‘bad’ cholesterol. Popcorn has an antioxidant known as ferulic acid that is beneficial in preventing neuro-degenerative diseases. It can help eliminate oxidative stress in diabetics. Furthermore, polyphenols protect the skin cells from environmental damage. Hence, popcorn also has anti-aging benefits for the skin. So, you can safely replace the high-calorie snacks, especially potato chips and cookies, with air-popped popcorn to remain in good health. Interestingly, a cup of unbuttered popcorn only has approximately 40 calories. Though it is not rich in most vitamins and nutrients still, it contains B vitamins like vitamin B1 (thiamine), B2 (riboflavin), niacin, etc. 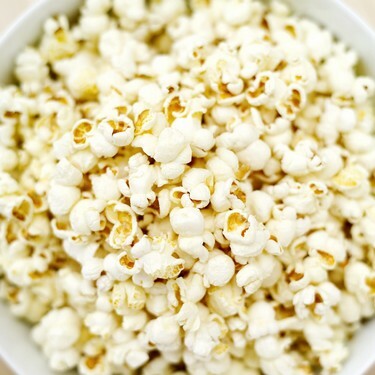 While taking popcorn as a healthy snack, make sure it does not have excess salt or sugar. Use of butter or any other fattening oil is another big no-no. Thus, you are not likely to derive nutritional benefits from this snack if you munch on the high-calorie oil-popped popcorn or theatre popcorn. Microwave popcorn is also not considered too healthy. It contains a chemical called diacetyl which, when inhaled, can cause a severe lung condition. This chemical is used to increase the buttering flavor in foods. Plus, some microwave popcorn bags have a Teflon-like coating that tends to break down with heat and hence release harmful chemicals. Therefore, it is better to have home-made rather than ready-made popcorn. To improve the taste, you can add grated Parmesan cheese, onion powder, garlic powder, chili powder, basil, lime juice, vinegar, cinnamon, curry powder, or dried cranberries in it. If you cannot do without oil and butter, consider adding mono or polyunsaturated oils such as olive or canola oil. Furthermore, keep in mind that there is a higher concentration of antioxidants in the hull. So, do not avoid eating the hull (the irritating portion that often gets stuck in the teeth) while chomping on this fluffy snack. In case you have dental problems, you can opt for special popcorns (hull-free) prepared from small kernels. Hence, they have comparatively softer hulls. Moreover, do not take popcorn as a substitute for organic fruits and vegetables because it is not packed with a number of vitamins and minerals.